I recently decided it was time to make a change in my lifestyle. 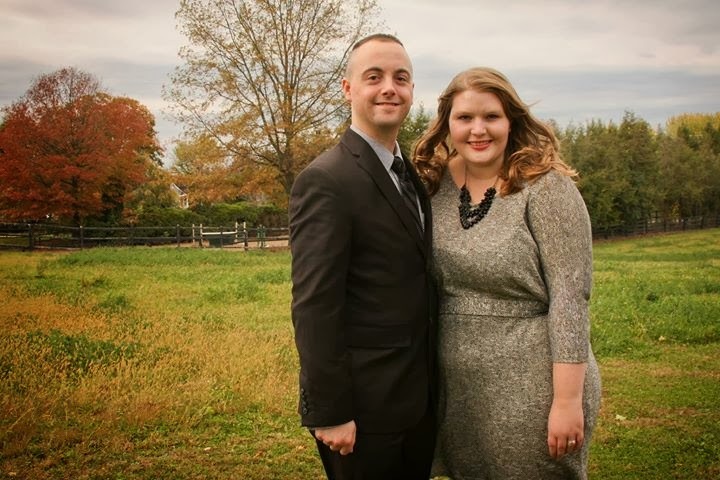 I always been on the heavier side, but ever since getting married and moving out on my own two years ago I've just noticed my weight going up and up. It's just been a constant "wow this the heaviest I've ever been" over...and over...and over again going up and up and up on the scale. I've been so unhappy with certain body features and clothing sizes as of late. I've been unhappy with looking back on pictures where I'm wearing super control-top pantyhose and STILL basically look like I'm pregnant. So finally after hubby and I booked a vacation to go back to Jamaica this May, I decided I didn't want to worry about looking back on MORE pictures from our fun vacation and not remembering the fun times we had because I'm only able to focus on how chubby I look in the photos. I started a diet. Part of what gave me the confidence to start this journey is honestly one day just being able to run for 30 minutes straight on the treadmill. I may be big, but I have always exercised at least. Before I started dieting I tried to workout three days a week. I would go to Zumba one day and run on the treadmill two other days. However, my treadmill routine consisted of walking five minutes, running at 5mph for 10 min., walking 5, jogging 5, walking 5, jogging 5, walking 5. Not super intense. One morning though I got to the end of my 10 minutes of jogging and just thought, "this isn't too hard, I guess I can keep going." So I did. I went past the 15 minute mark, 20 minute mark, and ran for 30 minutes straight. I used to be able to do this in high school/early college but not since I've been married. I just felt so empowered and strong like I could really do something. That didn't immediately spark a change though. It's just so easy to fall back into what is comfortable and not push yourself as far as you can go. So it took booking a vacation and wanting to look decent in a bathing suit to push myself to try and go farther. But you know what? Recently I've been able to jog for 45 minutes+ straight with no problems! So, exercise has been a big change for me. I'm now working out EVERY DAY instead of 3 times a week. Right now I normally go to a Zumba class at my gym on Monday nights, run on the treadmill Tuesdays, do some type or workout video or Zumba video at home on Wednesdays (more low-key), run on the treadmill Thursdays, get up early and do a Jillian Michaels DVD on Fridays, bust it out at the gym on Saturdays mornings (normally on the elliptical and/or Zumba class), and do something low key around home like go for a long walk or hike outside with hubby on Sundays. My biggest struggle has always been food. And accurately tracking how many calories I burn during workouts has made it easier to calculate how many calories I can eat for the rest of the day. I've been using My Fitness Pal (username is mygirlishwhims if you want to friend me!) to keep me on track which has been SUPER helpful. 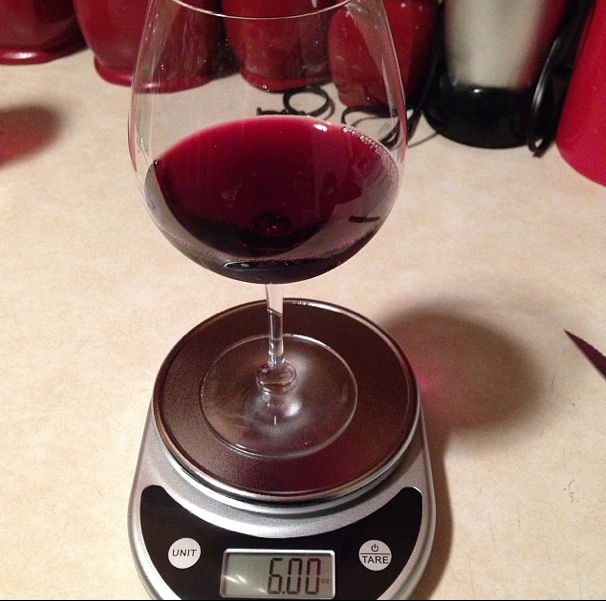 Measuring out my wine like a good girl...this Food Scale has been super helpful for counting calories! I've also made a big adjustment to the types of food I cook for dinner. I think part of the reason my weight has spiraled out of control since I got married is that I've really enjoyed learning how to cook and make really yummy food. Unfortunately, most of the yummy food I was cooking was not very healthy!! So I've committed to cooking more healthy meals. I've made a lot of recipes from Cooking Light and it's been a big eye opener that food can still taste good without tons of cheese or heavy cream or gobs of pasta in it. Portion control has also been a huge thing for me. If a Cooking Light recipe says it makes four servings I now scoop out the four servings (two for me and hubby for dinner, one for a lunch for him the next day, and one for either a second helping for him or another lunch) into separate dishes so I only eat a smaller serving instead of piling it on my plate like I would have before. I really have not felt super hungry since I started this diet, I've just been eating more healthy foods and in more appropriate amounts. I'm certainly not 100% gong-ho diet all the time though. Normally at least once during the weekend we are out with friends or order take-out for home and I eat pretty bad. BUT, the difference I think now is that I'm doing well the rest of the week that it isn't as big of a deal. Sometimes I'm up on the scale the next day which motivates me to hit it hard at the gym or sometimes I'm even down on the scale the next day which is crazy to me!!! To be frank I'm pretty proud of dropping these 11 pounds in a month. I have my My Fitness Pal app set to loose 1.5 pounds a week so I have already surpassed that rate for sure. I really have not noticed any difference in how I look or how my clothes are fitting yet, but I'm sure after another 11 pounds gone I will :) I'm sure it's bound to get harder though: today I logged in to my My Fitness Pal account and it congratulated me for losing over 10 pounds and then promptly told me to update my goals and reduced my daily calorie intake goal BOOOO. If I keep this rate up though I'll be down 33 more pounds by the time we go to Jamaica!! Wow that sounds like a lot. I'm not expecting quite that much to be gone by then but it does feel good to have a tangible goal in sight as something to work towards. So onward I go...I'll keep you posted for sure. I'd love to hear if any of you have had any success with loosing weight or if you have any healthy recipes to share...drop me a note in the comments!! You are off to a great start! Congratulations! What an inspiring start! I think you are beautiful already, but I know how it feels to be unhappy with your weight. Three years ago I was about 55 pounds heavier than I am today, and I *still* have a hard time not seeing myself as a 'big' girl (it took me a full two years at my lower weight before I automatically shopped in the smaller size clothing section...it was just ingrained in my head that I was a size large or bigger). Your workout ethic leaves me in awe...I wish I could run for 30+ minutes! And seven days a week at that! I live at 7000 feet and I'm lucky to keep pace walking up a large hill lol. Well done, 11lb is amazing! You have inspired me to kickstart my weight loss plan again! Congratulations! You've got the right attitude in that you can eat more occasionally and not let yourself get down in the dumps for doing that. That is a bad attitude and very unhelpful so you just keep on keeping on because you've got the right attitude. :) I live in Ohio and my treadmill is in my garage. I'm afraid to even touch the poor thing with the low temps we've had so I'm waiting for temps above freezing before I can get on it and even walk due to arthritis. I am so pleased for you and like the others will be cheering you on. You are off to such a great start - good job! I'm in the same boat as you. I've been exercising more consistently and watching what I eat. I also love SparkPeople. It's a great way to track food and exercise. Good for you! I am also in the midst of a change to try and jumpstart a healthier lifestyle. I did a diet bet (and won!) at the end of January (www.dietbetter.com) and have been using www.popsugar.com for their PLETHORA of workout videos. I hate doing the same video over and over again, so I find I don't get bored with all the selection. Way to go! Keep it up!